A cartoonist has reimagined Star Wars as if it were created by Dr. Seuss instead of George Lucas. In Adam Watson's world, Dr. Seuss's One Fish Two Fish Red Fish Blue Fish might have been called One Jedi Two Jedi Red Jedi Blue Jedi instead. The cartoonist is currently mashing Star Wars with the style of the children's book author for a project that you could probably call Seuss Wars, if you really want to. Watson's project started out as a doodle, but has become something that is already pretty cool. 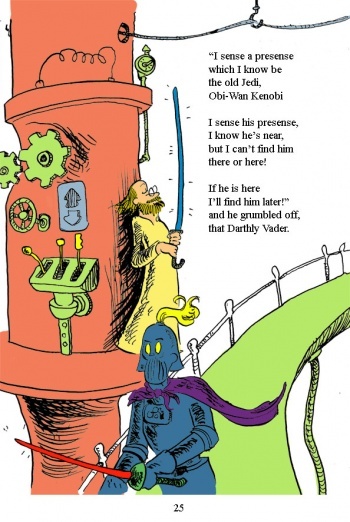 As of this writing, he has six illustrations of popular Star Wars characters and scenes, but they are undeniably Dr. Seuss-ed up through and through. 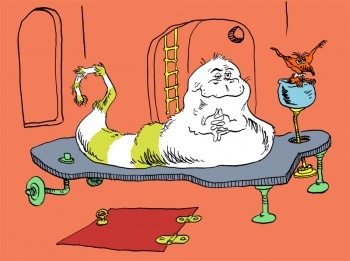 Dr. Seuss's Jabba the Hut is noticeably less slimy than George Lucas's original creation, which is a plus. There are almost no words for how awesome Watson's Seuss Wars Darth Vader and Chewbacca are, so you'll just have to see for yourself in the following images. So far Watson has done a few pages of Seuss Wars with Dr. Seuss-style poetry alongside of the art, and it fits really well in my opinion. 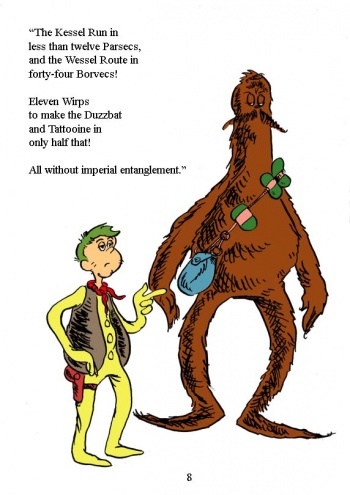 I don't think I'm alone in saying that I would buy an entire book or three of Seuss Wars if it were somehow possible to produce it, but it likely isn't without Lucas or the Lorax showing up at Watson's door. Still, Watson's work makes for some great fan art, and I'm sure those books are really great reads in the alternate dimensions they exist in. Check out the rest of Seuss Wars here.